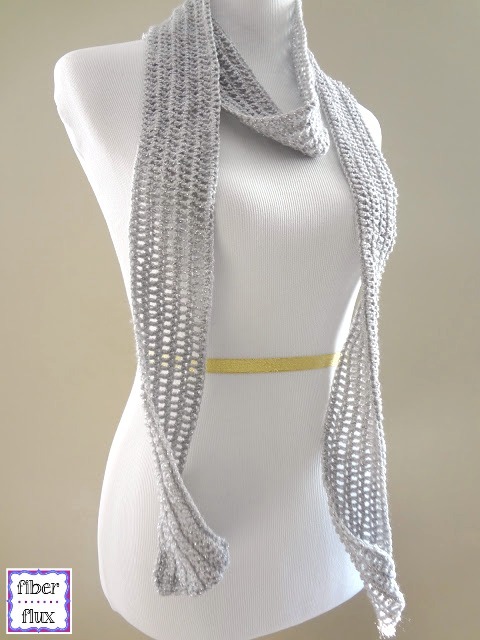 Fiber Flux: Free Crochet Pattern...Silver Dollar Skinny Scarf! Free Crochet Pattern...Silver Dollar Skinny Scarf! The Silver Dollar Skinny Scarf is a fabulous and festive accessory when you want to add a little sparkle without going over the top. Soft, simple, and subtle it works up quickly and the size is easily customizable. Makes a lovely gift too. Ch 300 for the scarf as shown. If a different length is desired, simply chain to the length desired plus two. Foundation Row: In the 2nd chain from the hook, sc, then work one sc in each ch to the end of the row. Row 1: Turn, ch 3 and work 1 dc in the first space, and in each space to the end of row. Row 2: Turn, ch 3 and work 1 sc in the first space, then work 1 sc in each space to the end of row. Repeat rows 1-2 five times or until desired width is reached. Weave in all ends and you're ready to sparkle! This is lovely, simple, yet so effective! Another one of your designs I have to try! Oh this is glamorous and lovely!! Can't wait to try this one! Love the scarf, and the bit of metallic thread in the yarn makes it so festive. Thank you! I'm making this right now in Vanna's Glamour color Onyx. It's looking beautiful so far! Very festive and very elegant. I'm going to crochet it for my mother in law. I'm unable to move around very much, due to fractured leg, so I'm just crochetting lots of scarves for this Christmas. Thank you, hang in there! Everyone will be thankful to receive hand made things from you! 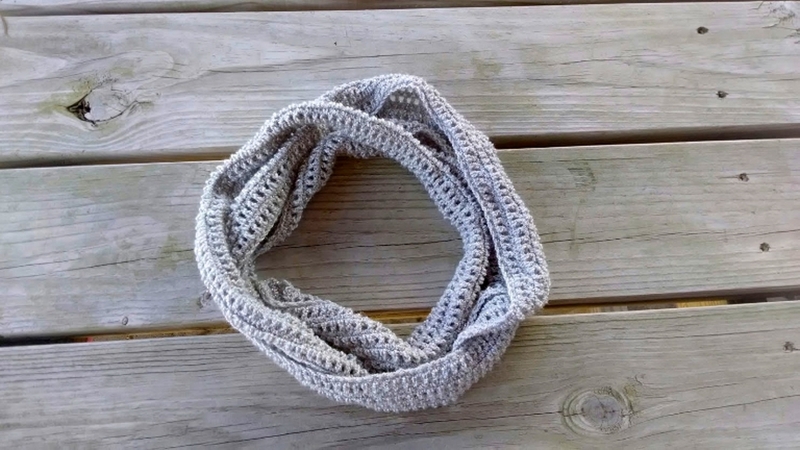 I loved this scarf as soon as I saw it, so I got started on crocheting it immediately. I finished it last night, and was concerned because the scarf curled up on itself. Also, my stitch seemed a bit smaller than what appears in your photo. I used a G hook with Vanna's Glamour Yarn in Topaz. It came out beautiful other than the curling. Not sure if my stitch is too tight or what the problem may be. Any help would be appreciated. I purchased more yarn to make scarves for my daughter/daughter-in-laws, but will wait to see if you have an easy solution for my problem. Thank you so much in advance. Also, thank you for the patterns on your site. They are beautiful and can't wait to get to work on them. Because you've already finished your piece, you could add a few single crochet rows along the bottom of each end. Because the scarf is crocheted lengthwise, crocheting additional rows in the opposite direction might help. Additionally, you could add some kind of fabric or fleece backing to the scarf. I hope some of these ideas help! Mine did curl a bit too...you can kind of see it in the first picture, I kind of liked it that way. You could try starting with a foundation single crochet and that way the first row will definitely not be any tighter than the following rows. What size hook did you use? My stitch is really small. Thanks! I used a G hook...a few people found that when they made their beginning chain loosely too, it helped a lot to open things up a bit. Hope that helps you! I have made 6 of these scarfs for my sisters for Christmas. I added a silver thread with 4 of them and used a gold thread for the others they are all different colours (cannot of course give them the same colours) They are so wonderful that I am making some of my friends these for Christmas also. I shortened it for my 5 year old granddaughter as she loves pink and sparkles it came out absolutely beautiful. I always make my beginning chains loose and did not have any problem with curling but have another suggestion to add some silver beads (sew them on) or even silver pearls. It looks beautiful and just an elegant touch for one sister that can only have the best. That sounds gorgeous! Thanks for the suggestions about beads, what a great idea! I'm not sure what you mean by "work 1 dc in the first space, and in each space to the end of row." What space are you referring to? I'm new to your site and I have the same problem that was asked in a previous comment, but I can't find your reply. I'm not sure what you mean by "work 1 dc in the first space and in each space to the end of the row." What space are you referring to? Thanks. Hi there! Thank you both for a great question! The space I am referring to is the space in between each stitch. So instead working a dc into the stitch, you would work it into the spaces created from the previous row. I viewed your tutorial on chain spaces and I understand it, but with a granny square there is an actual chain space created by a ch 1 in the previous row. Your foundation row or the other rows have no chain 1 spaces in the pattern. Do you just fit your sc and dc in between the stitches in the previous row or should we be actually doing a stitch, ch 1 and a stitch? Hi! I started this scarf last night and the same question came up for me. I finished the foundation row of sc, and then tried the dc's fit in between the actual sc stitches in the previous row.....and it works. You will begin to see the spacing between the dc's that you see in Jennifer's picture. My spaces between the dc's don't look as big as hers do, but I tend to crochet kind of tightly. I'm trying to loosen up the tension a bit, and then I'm going to try and get it to relax a little more when I block it. Hope this is helpful! You are so welcome, I'm glad you like it! Can't wait to try this. It's a beautiful scarf and just what I need for this coming weekend. Thanks for sharing.